As a young man, Feininger wanted to pursue a musical vocation. He was an accomplished violinist and hoped to compose a series of fugues for the organ. However, in 1887 he traveled to Germany to study art at the Königliche Akademie in Berlin. Within a few years, "Leo" (as he was called) became a highly successful cartoonist and caricaturist, working for Berlin and Paris newspapers for about fifteen years. After meeting Robert Delaunay in Paris, Feininger became very interested in Cubism. While his work absorbed these Cubist influences, it also reflected the artist’s musical leanings. "Music is as much my life as air and creating in paint," he said. "My pictures are ever nearing closer to the Synthesis of the fugue...Cubism is a synthesis, but may easily be degraded into mechanism... My 'Cubism'... is visionary, not physical." Feininger’s first major exhibition took place around that time, in 1917, at Herwarth Walden's avant-garde Sturm gallery in Berlin. During World War I, Feininger was detained as an enemy alien due to his U.S. citizenship. In the summer of 1918 he obtained permission from the police in Zehldorf to go to a resort in the Harz Mountains for his health. It was here that he first experimented with woodblock printing, possibly inspired by his friend Karl Schmidt–Rottluff. 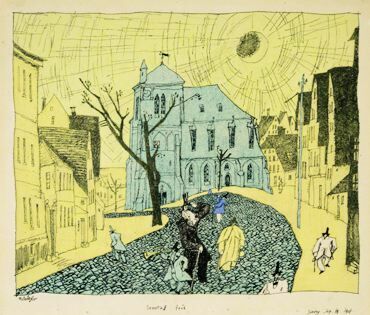 In the ensuing three years, Feininger produced over 200 woodcuts. He printed most of the impressions by hand with the help of his wife and sons. Consequently, inconsistencies of pressure and placement were common. The many variations in the impressions are heightened by the use of different paper types. Feininger made no color prints, preferring to explore the essential qualities of form in black and white. Feininger remained rather aloof from all the Expressionist groups. He exhibited with the Blaue Reiter and was also connected to the members of Die Brücke, but was not formally a member of either group. (He and Karl Schmidt-Rottluff were, however, especially close.) Feininger was one of the first artists whom Walter Gropius invited to join the Bauhaus in 1919, and he remained affiliated with the school until it was shut down by the Nazis in 1933. His woodcut Cathedral of Socialism was chosen for the cover of the First Bauhaus Manifesto. After Feininger's work was declared "degenerate" by the Nazis, 300 pieces were confiscated. In 1936, he returned to America for the first time since sailing to Hamburg in 1887. He had been invited by Alfred Neumeyer, along with various other artists including Beckmann, Léger, and Moholy-Nagy, to teach at Mills College in Oakland, California. As soon as he could, however, Feininger returned to Berlin, only to find it unlivable. He went back to America, first to Oakland and then, finally, to New York. Full of nostalgia for the time before the war and appalled with the present, he was unable to paint for the next two years. However, Feininger eventually found his bearings in the U.S., creating a series of murals for the 1939 New York Worlds Fair and helping to establish the New Bauhaus in Chicago. He died in New York City in 1956.